This striking ritual crescent-shaped chopper or flaying knife is composed of a single piece of craved rock crystal with gilded brass mounts set with turquoise, coral and other stones. The crystal is particularly beautiful on account of the many inclusions contained within which catch and disperse the light. 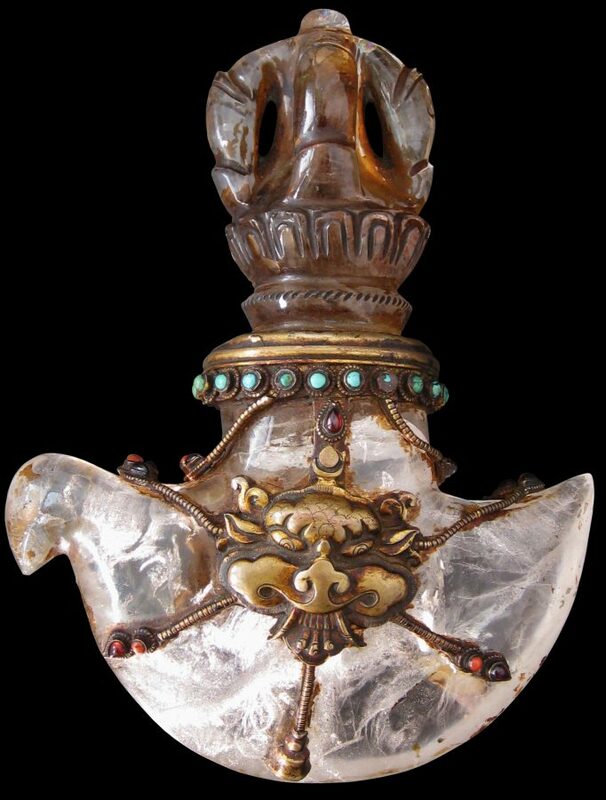 The contrast between the translucent crystal and the richness of the gilded mounts makes this ritual weapon especially attractive. The blade of the chopper is decorated on both sides with akirtimukha face – the face of glory or majesty. (Technically, the face appears to be more like that of a lion in which case it is more properly known as a simhamukha face.) The face is depicted without a lower jaw, as is typical of Tibetan renderings of this face which has variants across South and Southeast Asia. Three jewels are shown on the extended tongue and strings of jewels are shown emitting from the face. Thevajra copper is common attribute of the fiercest deities in the Tibetan Buddhist pantheon. The blade itself symbolises the wisdom of voidness that cuts through the knots of ignorance. The handle of this example comprises a five-prong vajra or thunderbolt. Usually, ritual choppers are made of metal alone. It is unusual for them to be made from rock crystal, although an earlier rock crystal example is illustrated in Pal (1990, p. 246). At one point the chopper was coated in a yellow pigment and animal glue mix but this has now largely worn away. It is not unusual in the Buddhist world for religious objects and images of deities to be made of precious material and then to have them covered with gilding or some other colouring in lieu of gilding. When items are viewed purely on aesthetic grounds then this practice may not make sense but these objects are first and foremost items of a religious nature. The use of precious material in the first instance is an act of merit. To then cover this material with gold leaf or a coloured pigment is a further act of merit. 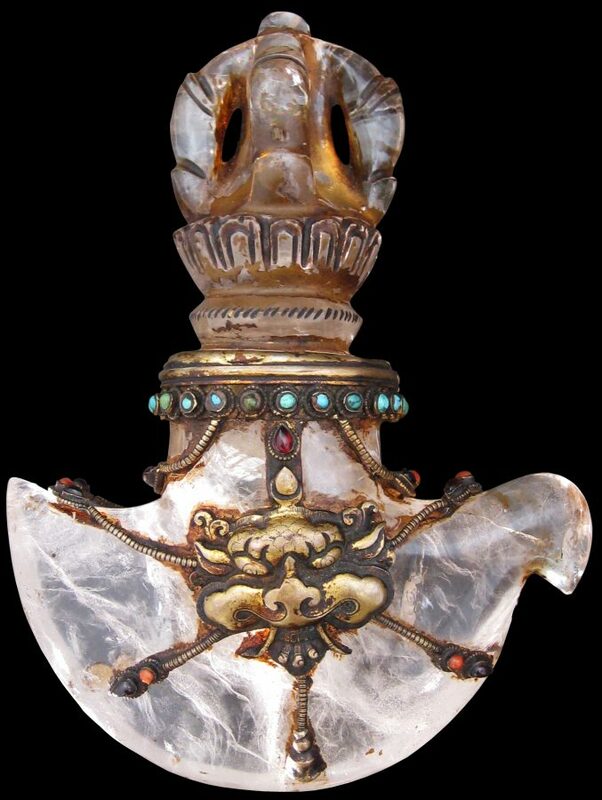 A Tibetan ritual dagger (phurbu) made entirely of rock crystal, attributed to the 17th-18th century and 25.5cm long which comprised Lot 13 in Sotheby’s New York, ‘Indian, Himalayan, South-east Asian and Indian Miniatures’ sale of September 20-21, 1985, similarly seems to be have been coated but with much of the coating having worn away. Sometimes images of bodhisattvas in translucent jade were entirely covered in gilding in Ming China, and some Buddha images in Burma today are so entirely covered in gold leaf and other material that the original material has become entirely obscured and the shape of the image distorted. The use of inlaid stones and the form of the metal work suggests that the chopper possibly was made by Newar craftsmen operating in Tibet, possibly in the Gyanste region. (Ethnic Newars have their origins in the Kathmandu Valley.) The use of the kirtimukha face or mask is also another pointer to Newari craftsmanship: the image is particularly popular with Newar craftsmen. 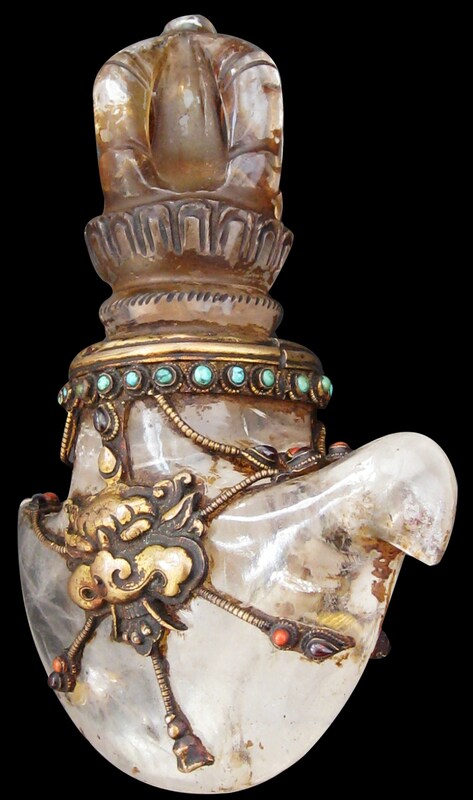 There is a wide variation of datings ascribed to Tibetan rock crystal items. But with the patina on the gilded copper mounts of the chopper here a dating of around the first part of the nineteenth century is suggested. This item was obtained from the Scottish art market. It is not unusual for South Asian and associated items to be sourced from Scotland. Many Scots were employed in the Indian colonial administration and today many families in Scotland and the English border areas retain colonial keepsakes. Pal, P., Art of Tibet, Los Angeles County Museum of Art, 1990. Shanghai Museum, Treasures from Snow Mountains: Gems of Tibetan Cultural Relics, Shanghai Museum, 2001. Pal, P., Himalayas: An Aesthetic Adventure, The Art Institute of Chicago, 2004. Beer, R., The Encyclopedia of Tibetan Symbols and Motifs, Serindia, 2004.